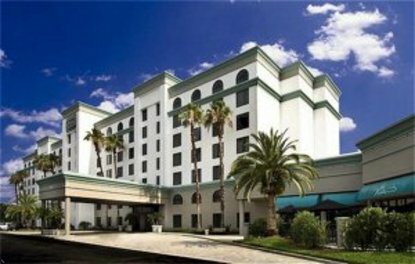 Orlando's suite treat, located just 1.5 miles from Disney, 280 spacious two room suites, private bedroom, elegantly furnished with separate living room, full size sofa sleeper, iron/ironing board, 2 TV's, 2 telephones with voicemail and data ports. King deluxe suites feature whirlpool jacuzzi tub for two, complimentary full American breakfast buffet served daily in the Valencia room. Enjoy cocktails and tasty treats available for lunch and dinner in the citrus bar and grill. Complimentary scheduled transportation to all 4 Walt Disney theme parks. Free shopping shuttles to the lake Buena Vista factory stores and the Florida mall. Heated pool, jacuzzi, lighted tennis courts, exercise room, game room and gift shop. Complimentary shuttle to Walt Disney World attractions.